I recently wrote an article for my blog about my own experience of being diagnosed with Multiple Sclerosis and had loads of great feedback from my readers who could completely relate to the thoughts, feelings and troubles I’d faced. 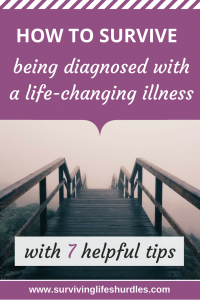 Clearly a lot of what I’d experienced is fairly normal when being diagnosed with a life-changing illness, with many people struggling to fully get to grips with their new diagnosis. It really made me think about what advice I would have most benefited from at such a lonely, confusing and quite frankly, shocking time. I was really lucky to meet and connect with some fellow MS suffers leading up to my diagnosis and this went a long way in helping me to come to terms with my illness. They got what I was going through in a way that no one else could and our shared illness led to open and frank dialogues where no question was considered too strange and no topic was out of bounds, no matter how personal! Once my illness was ‘out there’ I had friends-of-friends who had the same illness queuing up to offer their support and advice. I appreciated it so much, it was lovely and just what I needed. I also actively took up opportunities to meet other MS suffers, including groups, meetings, courses etc. Your health specialists or local divisions of health-related charities are good places to start to find more information about these sort of events. Even though I’m a shy person mixing with a variety of newly-diagnosed and longer-term suffers was really helpful and totally worth putting myself out of my comfort zone for. Reading personal accounts of the experiences of others on forums and in blogs (like this one) is usually a great way to find more information and to start making connections too and will mean you start to feel less alone with what you’re going through. Fight your corner- push for the best treatment and the best support you can get. It’s a sad truth that when you’re at your most ill and feeling de-railed and vulnerable, that’s when you can feel medical support can sometimes be shockingly lacking or painfully slow to appear. I’ve had experienced medical professionals write off relapse symptoms as a cold when an MRI later proved otherwise and had life-altering and much-needed treatment delayed unnecessarily due to this. The time when I was feeling my worst and was crippled with fatigue was when I had to repeatedly waste valuable energy chasing down test results which were massively overdue. Please don’t think me unappreciative, I couldn’t be more grateful of all the amazing medical support and guidance I have received during and since my diagnosis. All I’m saying is that greatness is unlikely to happen 100% of the time, so don’t always expect it and be ready to fight your own corner should you need to. As harsh as it sounds and as hard as it can be when you’re ill you will be the one who suffers if you’re not pushy when you need to be so it’s in your best interest to ensure you are getting the right support for you, when you need it. Also, don’t forget to lean on your friends and family when you require a bit of extra assistance to so they can help fight your corner too. The sooner you start to understand more about your illness the easier it will be to get your head around it all and what it means for you. Find the best, most reputable websites where you can access some really useful tools, resources and publications and share these with close family and friends too. For me the MS Trust and MS Society were great sources of information when I was first diagnosed and I signed up for their newsletters too for regular news and updates. It’s also really important to talk to your friends and family about what you’ve learnt and what you are experiencing. I don’t think I communicated this very well at first to those around me and then felt increasingly frustrated when people didn’t seem to understand what I was going through. The more I shared though, the more they understood and the better supported I felt. Always remember it’s completely up to you who you disclose your illness to and who you don’t. You may want to take your time to come to terms with your illness so you understand it a bit better before you start telling people about it. Also, at the end of the day it really isn’t most peoples’ business anyway. If your illness isn’t impacting on your life much right now then it isn’t really that important for other people to know about it. However, if your illness is causing you difficulties then you may wish to tell more people for the simple fact they will then be able to support you better. When I first got diagnosed I decided to inform my employer because I felt they would then be able to help me to do my job more effectively. It worked. My employer did all that they could to support me in the workplace and it was a huge relief, however I realise that sadly not all employers are quite so accommodating. I know this sounds obvious but if a medical practitioner tells you to do something for the good of your health then you must do it (if you don’t have confidence in their advice seek a second opinion from another health professional but please don’t just ignore it). If you’re diagnosed with a life-changing illness it’s especially important that you maintain the best general health that you can. This may mean you have to stop smoking, eat healthier or get more exercise but as hard as this might be for you get whatever help that you can, be honest with yourself and start making some changes wherever possible. Remember that a small improvement is better than no improvement and your progress will then give you a small success to build on. Now is definitely not the right time to take on any more unnecessary stresses or additional workload. Delegate whatever you can and learn to say ‘no’ rather than ‘yes’ to any new responsibilities. You may physically need to rest or just need a bit of time to think things through. If you’re anything like me you will probably feel guilty for doing this but at the end of the day you are ill and you need to give your mind and body the time they both need to recover. If you can’t always be there for others at this time you will find that the people who are worth having in your life will be there for you instead. They will help you to put your needs first, help you to deal with the serious stuff but also keep everything a little more light-hearted too when a bit of laughter is much-needed in your life. I found when I received my diagnosis that my imagination would often create two very different future scenarios; a dream scenario, where against the odds I would bounce back from my relapse and I would go back to my previous life, never getting any worse or the nightmare scenario, where I would deteriorate rapidly and dramatically, experiencing all of the worst MS symptoms to the extreme and my life would effectively be over. Both scenarios were very damaging to my overall wellbeing and didn’t help me in the slightest to accept and adapt to my diagnosis. All you should focus on is what you are currently experiencing and how to best deal with that. It will be a learning curve and along the way you will find what works for you and what doesn’t and that’s ok.
You may also need to suggest your ‘here and now’ strategy to your friends and family as they can often start imagining the perfect outcome or worst case scenario for your illness too which won’t help either you or them. I really hope that my own story and insights into surviving being diagnosed with a life-changing illness are helpful to you and your situation. If you know someone who has recently been diagnosed with a life-changing illness please don’t hesitate to share this article with them, I’m sure they would really appreciate such a thoughtful gesture! Wishing you all the best for the rest of your journey and remember, if you’d like to share or talk through your own experiences I’m always here to listen. Thank you, I really hope that as many people as possible find it helpful! Encouraging message. So glad you are living unstoppable! Cheers! I was recently diagnosed with lupus and this post is what I needed to hear. These are all great steps and they make me feel a bit more level headed and prepared. Thank you! Thank you so much, I’m really glad that I could help! Wishing you all the best. Great post. Your advice about needing to completely advocate for yourself with your medical team was spot on. I’d add to that that if something is not right and you are not happy with the service you are receiving from your provider then change them. Trust your gut and act on it. Thank you. I completely agree, I would always say that if you aren’t happy with the quality of the medical advice you are being given then actively seek out a second opinion. I definitely could have used some advice like this when I was first diagnosed. I tried too hard to ignore my illness and of course it didn’t work very well for me. Yes, I was exactly the same! So hard trying to adjust isn’t it? Thanks for your lovely comment and for hosting the link-up, I think it’s fantastic!